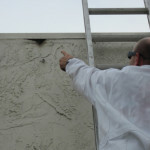 We safely and humanely remove beehives from your property. 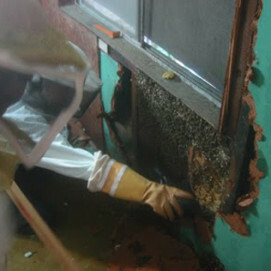 Bee Safe is Central Virginia’s Ultra Safe and Humane Bee Hive Removal Service. BeeSafe Removal is a Beehive Removal Service based in Bumpass, VA. We safely and humanely remove bees from your property and provide full prep, clean-up and repair after bees are removed. Currently we remove bee hives in Louisa, Mineral, Goochland, Powhatan, Richmond and surrounding areas. Have a hive safely and professionally removed from your home as soon as possible to avoid the dangers and risks associated with having a bee colony in or around your living space. From the moment a swarm lands and begins marking the location with urine-based pheromone, to the time when honeycomb becomes saturated, bee activity will always be accompanied with heat and moisture. Unfortunately, one only needs to add spores to this recipe to begin to grow mold very quickly. If bees have begun building a hive in your home, there is a good chance that mold may be growing along with it. 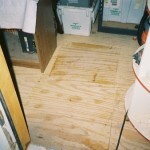 The sooner you have the bees and hive removed, the sooner you can stop mold from taking over in your home. Once bees are active inside of your home, one of the first things they may do is eat through your home’s moisture and or vapor barrier. 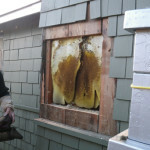 If a hive dies inside of your walls and honey is present, it may lead to severe cases of rot and rapid mold growth on and around framing members. NOTE: You should NEVER simply exterminate or kill bees in your home…the damages could be far greater if the hive isn’t removed. 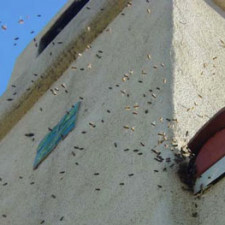 Over time, bees may also indirectly contribute to the problem by attracting wax moths. These moths feed on older sections of the hive and lay eggs in or near the hive. 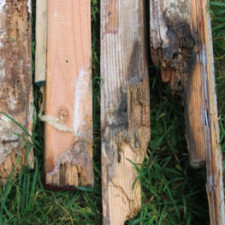 Once the moth larvae hatches, they’ll feed on wood studs. The longer moths are able to feed and lay eggs, the greater the structural damage will become. While you may only see a few bees leaving and entering your home at a time, there are usually thousands, even tens of thousands, in the colony. If bees become alarmed, they may begin actively defending their hive. By having bees professionally removed from your home, you can ensure your loved ones’ safety. Call for your free assessment now! BeeSafe Removal © All rights reserved.